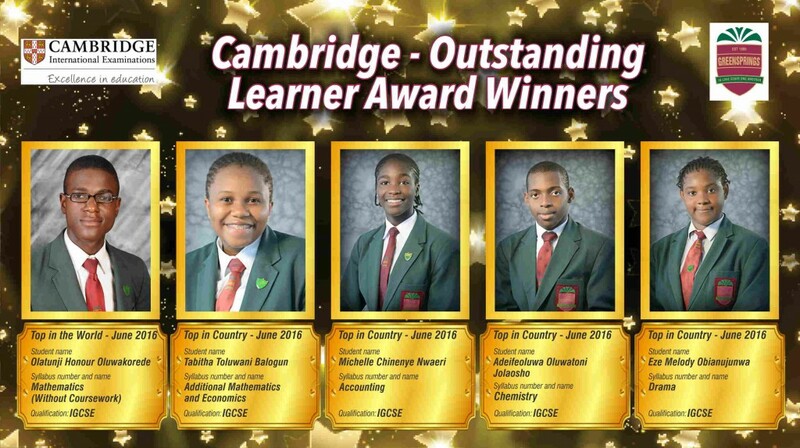 In 2016, six of our students received the Cambridge outstanding awards in their IGCSE. Honour Olatunji received an award for the Top in the world for IGCSE Maths. Five other students also obtained awards for emerging as top in the country in other subjects. Michelle Chinenye Nwaeri, Top in Country for Accounting; Tabitha Toluwani Balogun, Top in Country for Additional Mathematics & Economics; Adeifeoluwa Oluwatoni Jolaosho, Top in Country for Chemistry; Eze Melody Obianujunwa, Top in Country for Drama; Babajide Ajibola Gomez, Top in Country for Spanish.